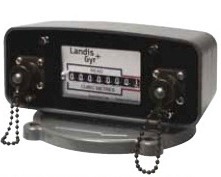 The Model 504 index can be fitted with various pulsing options. The pulse output consists of single or dual independent reed sensors that are highly reliable and have proven field life experience in the Australian gas industry. These sensors are dry contact that have been encapsulated in a plastic housing and hermetically sealed to ensure no deterioration when exposed to the Australian elements. Operating temperature range (oC) -40 to +100, 100V DC max, 0.25 Amps 10 Watts. Available in 3 basic options: dual independent reed switch 3 pin plug (pictured above), dual independent reed switch Single 4 pin plug, and dual independent reed switch one 2 pin plug and 1 terminal block and gland.